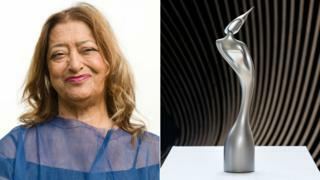 Next year's Brit Awards statuette, which was designed by the late Dame Zaha Hadid, has been unveiled. The British-Iraqi architect started work on the project three months before she died in March. Five different statues have been revealed, but only one - a depiction of Britannia with her hips to one side - will be handed out to winners at the February ceremony. Dame Zaha died aged 65 following a heart attack. She designed buildings including the London Olympic Aquatics Centre, which was used in the 2012 Olympics. "Like Zaha, they are innovative and original and have gone well beyond our expectations to create something special that will progress the award into the future." He said Dame Zaha had told him she had a "vision" for the creation. A statement from Dame Zaha's studio said: "Zaha had an initial meeting with her team and gave them very clear instructions on her concept. Her concept was fully respected and carried out in the final product but unfortunately she didn't see the final design." Maha Kutay, director of Zaha Hadid Design, who worked on the architect's original ideas, said: "Our design expresses Zaha's unwavering belief in progress and optimism for the future and a break from the norm." Artists Damien Hirst and Sir Peter Blake are among those to have previously designed versions of the statuette that is given to winners at the Brit Awards.